Featured Game: Clean Up the Money! This 2-player game challenges students to toss 2 dice, form a coordinate pair, then collect the coin from that space, if there is one. First students alternate placing quarters, dimes, nickels and pennies on the gameboard. Then students toss a regular die and a special die (A-B-C-D-E-F) to form the coordinate pair and remove the coin from the matching space. Variations of the game are given but students must always find the value of their coins to identify the winner of the game so they get plenty of practice sorting and counting coins. NOTE: Buy wooden cubes at craft stores to create the ABCDEF die or use labels to cover the faces of a regular die. Download Clean up the Money! Game for game board, directions and recording sheet for different versions of the game. 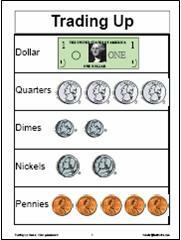 These games provide practice counting money and recognizing the value of coin collections. Trading Up Game: this 2-player game challenges students to toss 2 dice, calculate the sum and take that many cents from their bank. The student places these coins on his/her gameboard. The player "trades up" to higher value coins whenever possible and replaces coin collections with the larger value coin. The first player to trade up to the dollar bill wins the game. Download Trading up Game for b/w game board and directions. Download Trading up Game for color game board that shows coin faces. Clean Up the Money Game: this 2-player game challenges students to toss 2 dice, form a coordinate pair, then collect the coin from that space, if there is one. First students alternate placing quarters, dimes, nickels and pennies on the gameboard. Then students toss a regular die and a special die (A-B-C-D-E-F) to form the coordinate pair and remove the coin from the matching space. 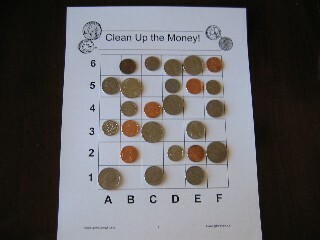 Variations of the game are given but students must always find the value of their coins to identify the winner of the game so they get plenty of practice sorting and counting coins. NOTE: Buy wooden cubes at craft stores to create the ABCDEF die or use labels to cover the faces of a regular die. Who Has? Coin Deck: Use coin stickers, stamps or cutouts to create a Who Has? coin deck for practice in counting collections of coins. See Who Has? Coins for a suggested sequence and directions for creating a 20-card coin deck for classroom use. NOTE: Since other students cannot see the card, the student "reads" the coins aloud. The card to the right would be read: I have 2 dimes. Who has 45 cents? 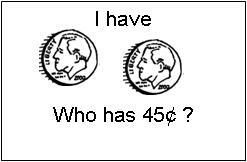 The next student would then answer: I have 1 quarter and 2 dimes. Who has 37 cents? and so on until the cards cycle back to the beginning card.